The Lendrum has made it SO MUCH EASIER to produce sewing thread. This is a three-ply tightly twisted organzine. I’m using three filaments per ply, and it’s making up to about the weight of Size C from Belding Corticelli; I hope to be able to make some Size A as well, for finer weaving. This is the three ply, approximately 20 twists per inch each way. 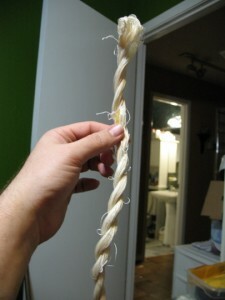 Because the raw silk is stiff, the skein stands upright, like a stick. The silk, boiled off. Yes, I used this picture earlier. 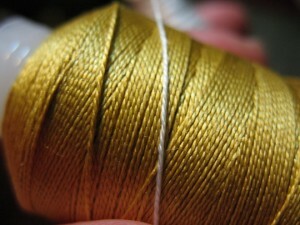 Laid across a spool of Belding Corticelli Size C sewing silk. I want to make Size A, too – but I may end up having to adjust the filament size to get there. We’ll see what a 2×3 looks like!